Following on from last time’s post, here, below the picture, are some more points I hold to be true. There is no such thing as sin and we don’t need God’s forgiveness for it. Sin is a Christian construct with no purchase in the real world. There is only human behaviour – good, bad and indifferent. Most of it is indifferent (or neutral if you like) including what consenting adults may do with each other sexually. Some of it is good, in the sense that it benefits others significantly; some of it is bad – evil even – because of the harm it causes others. None of it is offensive to God, because there isn’t a God, and none of it is forgiven by him for the same reason. We are moral or not, without the assistance of a God. This seems to me to be self-evident: if there is no God and yet we are capable of behaving morally then any goodness cannot come from him. Similarly, immoral behaviour, of which the religious are as capable as the rest of us, is also entirely human. No sin = nothing to be saved from = no redemption. The Christian claim that because atheists don’t acknowledge God they have no grounds for behaving morally is demonstrably false. The golden rule of ‘do unto others…’ is of value to us as social animals, which is why it pre-dates Jesus by millennia. Non-believers are as capable of behaving morally as believers, and sometimes a darn-sight better. It is impossible to know the future. No-one can know the future. The same Christians who castigate scientists for not being there when the Earth came into existence, have the temerity to claim they know what will happen at some indeterminate time in the future. There will be, they tell us, an anti-Christ, a rapture and Jesus will return from Heaven. They cannot know this of course, even if their holy book seems to predict it. It too was created by human beings with no more ability to read the future as anyone else. People have long wished they could tell what the future holds, which is why fortune tellers, astrologers, priests who read auspices, oracles and prophets have been with us throughout history. They’ve never been right, except by chance, for the simple expedient that humans are not gifted with accurate foresight. Biblical prophecies are no exception and have already failed, as we’ll see in future postings. We are all utterly reliant on other human beings, not God, to help us fulfil our needs. Believers do not turn to God when they are hungry, because if they did they would starve (in spite of what Jesus says in Matthew 6.25). 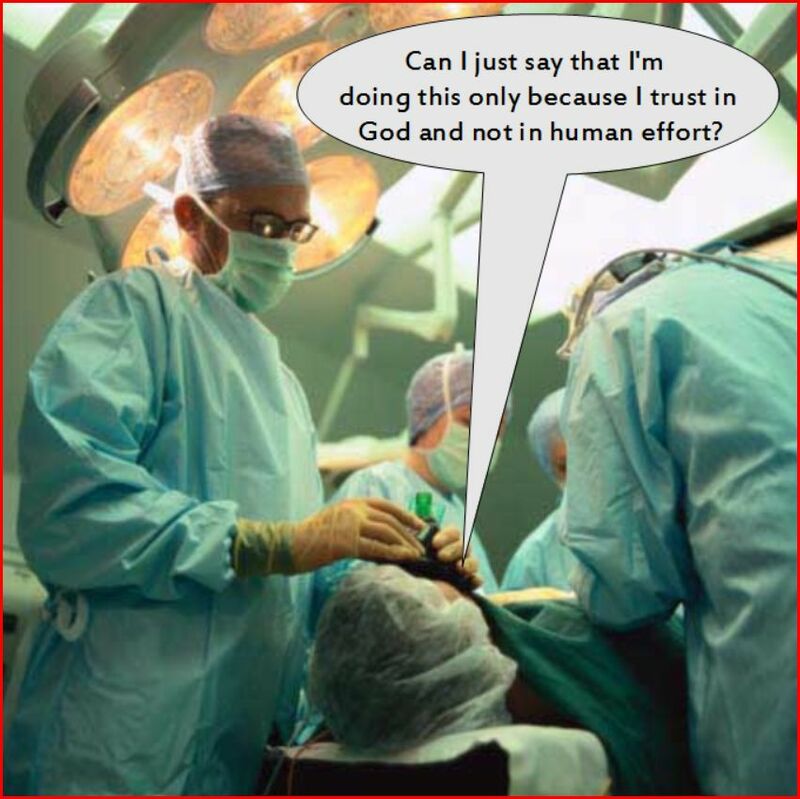 They don’t turn to him when they are ill, but look to medical science to help them (yes, there are a small minority of extremists who, because of faith in God and the likes of Mark 16.18, let their children die. But most believers don’t; they have faith in other humans, in science and technology). Christians and believers of all stripes demonstrate their faith, not in God but in human endeavours every time they get dressed, put on spectacles, catch a bus, board a plane, buy a house, switch on a computer, television or oven, use a phone, listen to music, admire art and marvel at architecture. None of this is God-given, it is all human, and believers, whatever else they may claim, are all humanists at heart, having far more faith in the human than the divine.